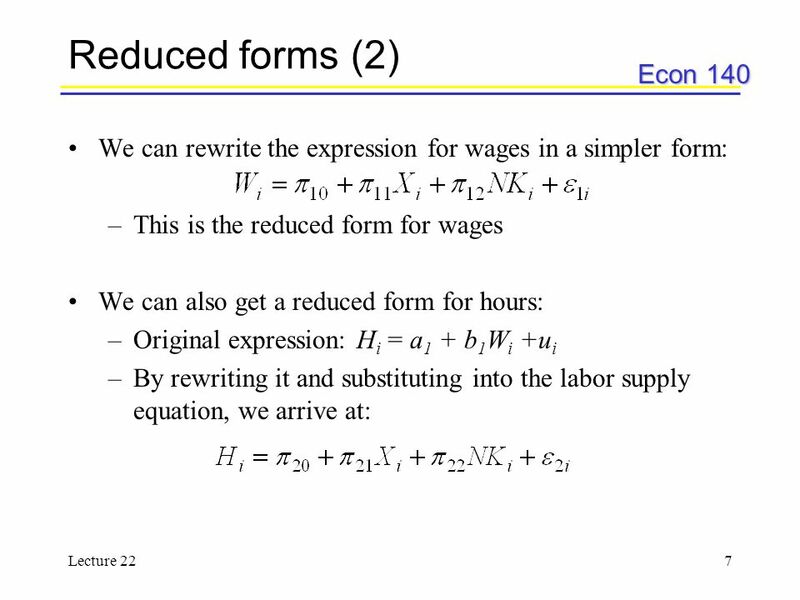 Econ 140 Lecture 221 Simultaneous Equations Lecture 22. 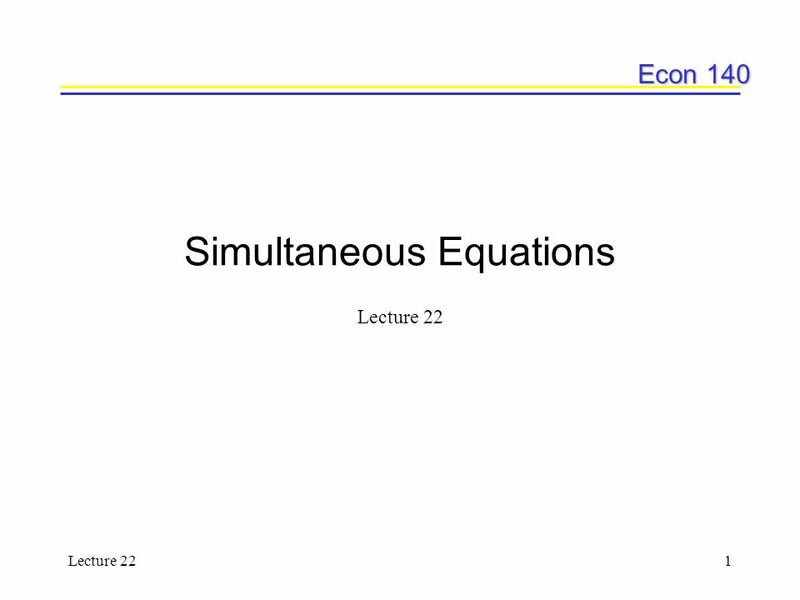 Download ppt "Econ 140 Lecture 221 Simultaneous Equations Lecture 22." 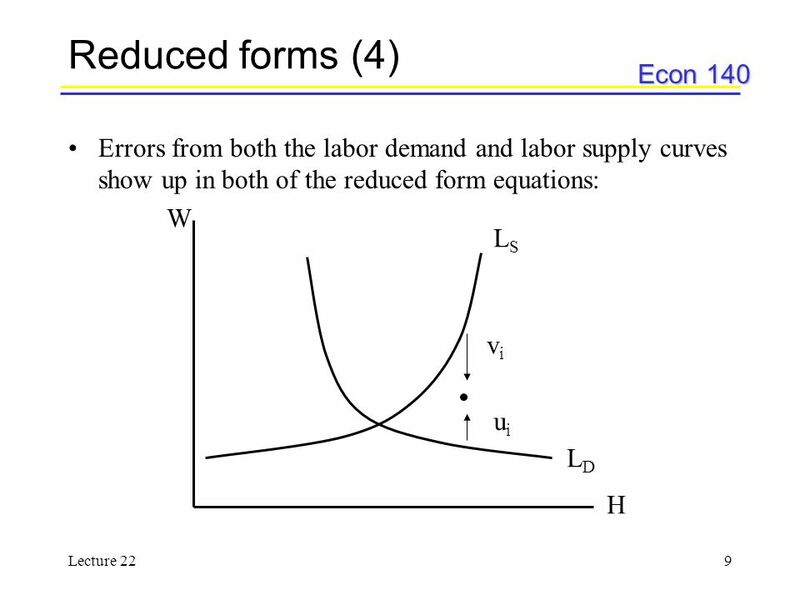 1 Efficiency and Productivity Measurement: Multi-output Distance and Cost functions D.S. 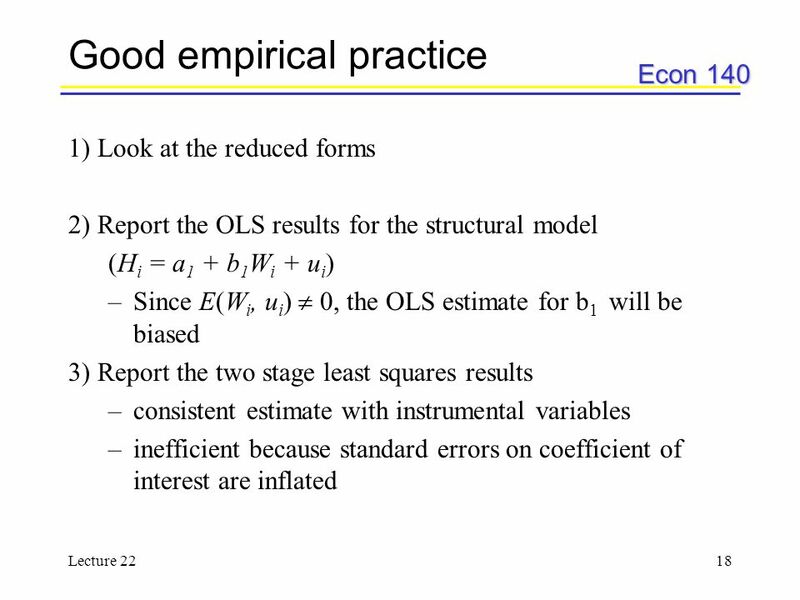 Prasada Rao School of Economics The University of Queensland Australia. 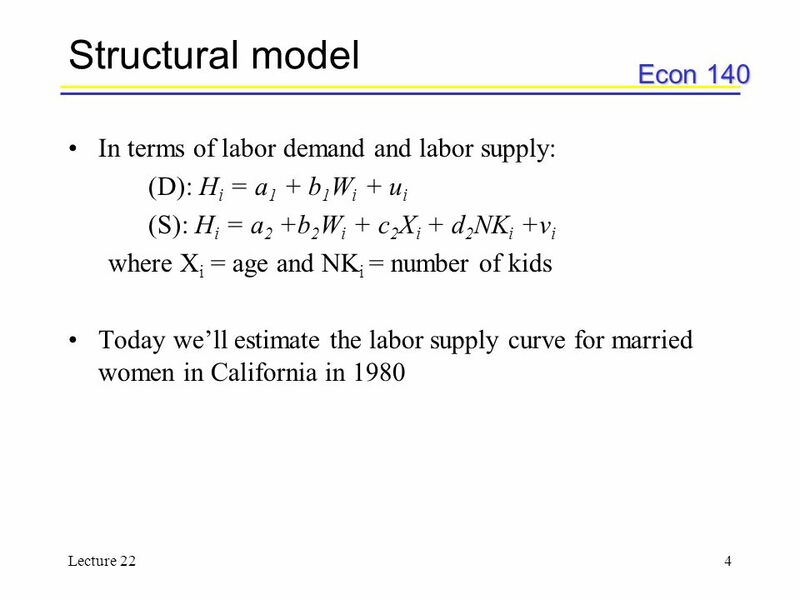 Macroeconomic Themes:221 Why Growth Rates Differs Across Countries? 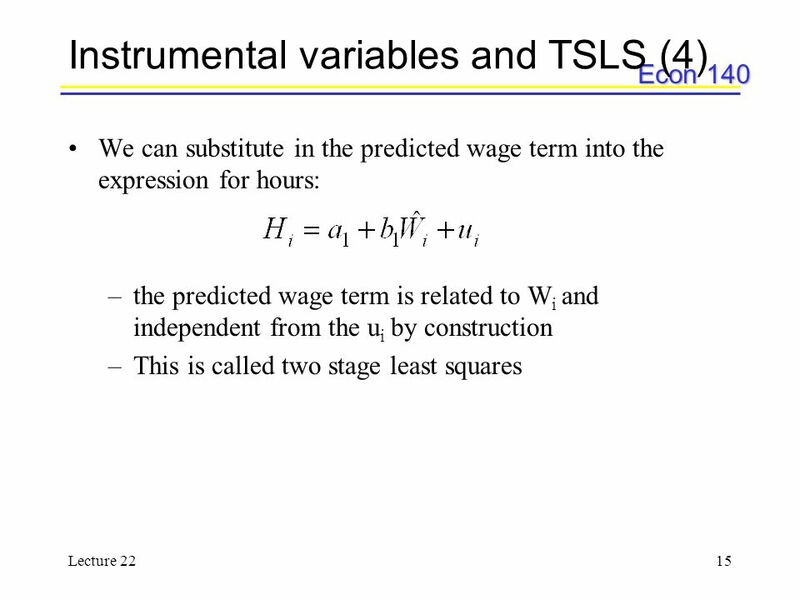 Heteroskedasticity Lecture 17 Lecture 17. 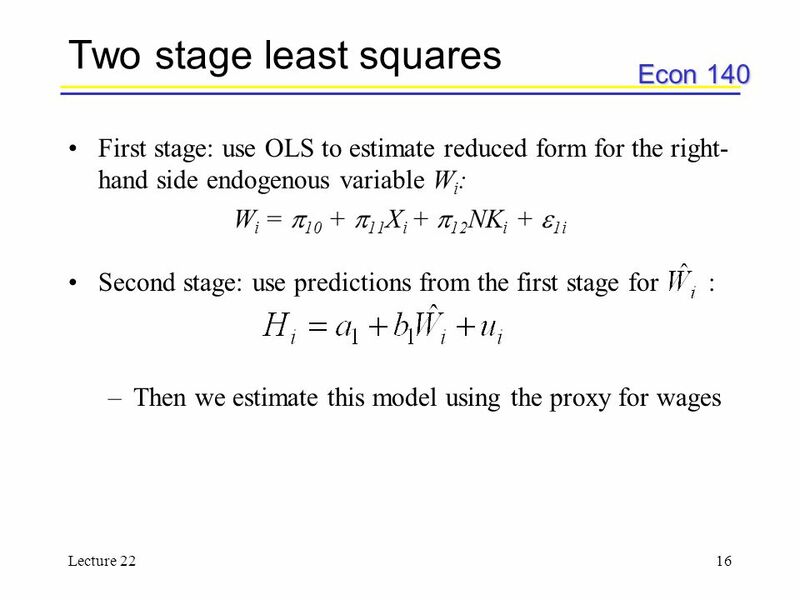 Christopher Dougherty EC220 - Introduction to econometrics (chapter 9) Slideshow: two-stage least squares Original citation: Dougherty, C. (2012) EC220. 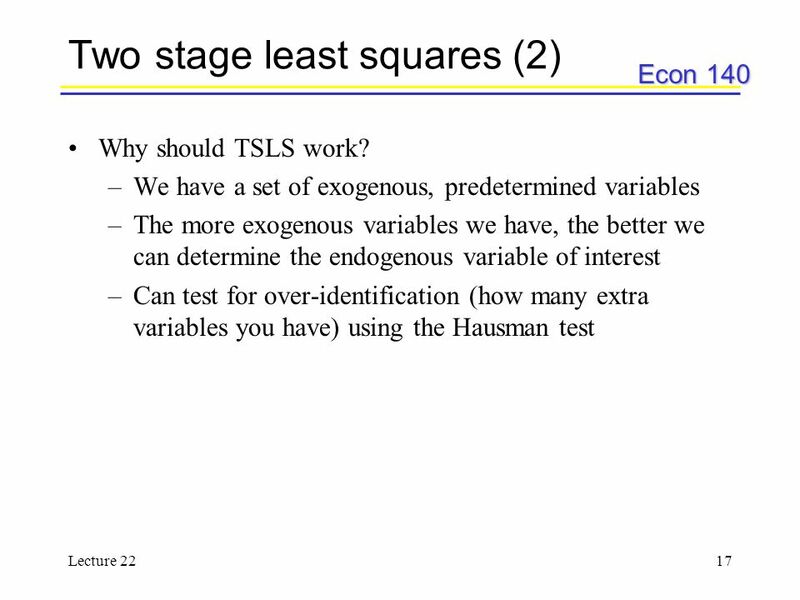 Autocorrelation Lecture 20 Lecture 20. 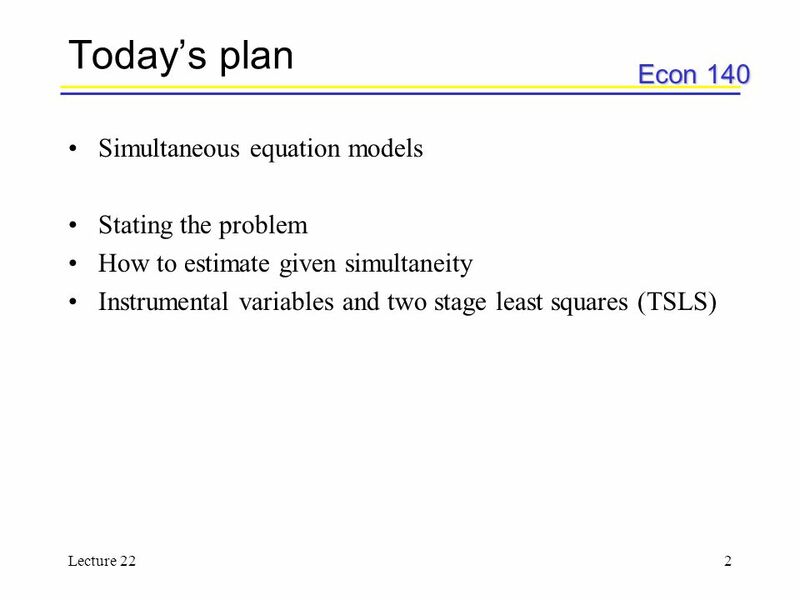 Economics 20 - Prof. Anderson1 Simultaneous Equations y 1 =  1 y 2 +  1 z 1 + u 1 y 2 =  2 y 1 +  2 z 2 + u 2. 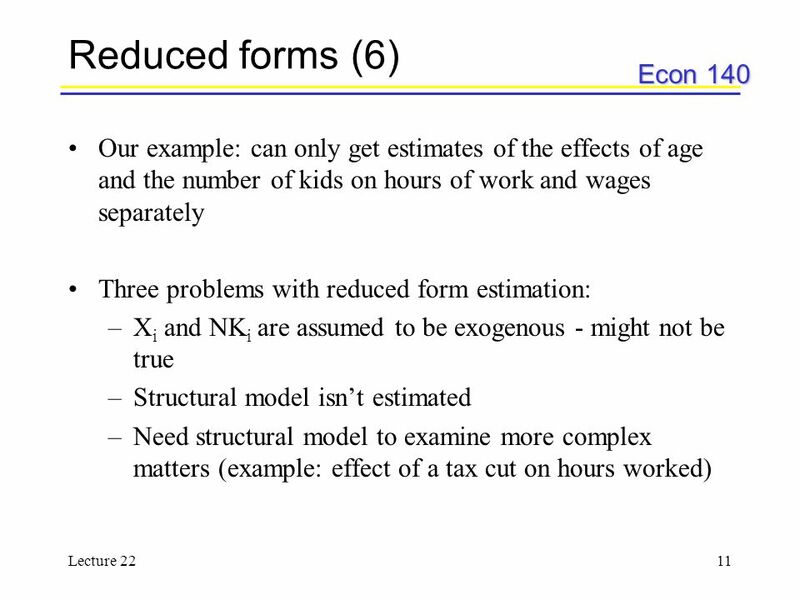 There are at least three generally recognized sources of endogeneity. 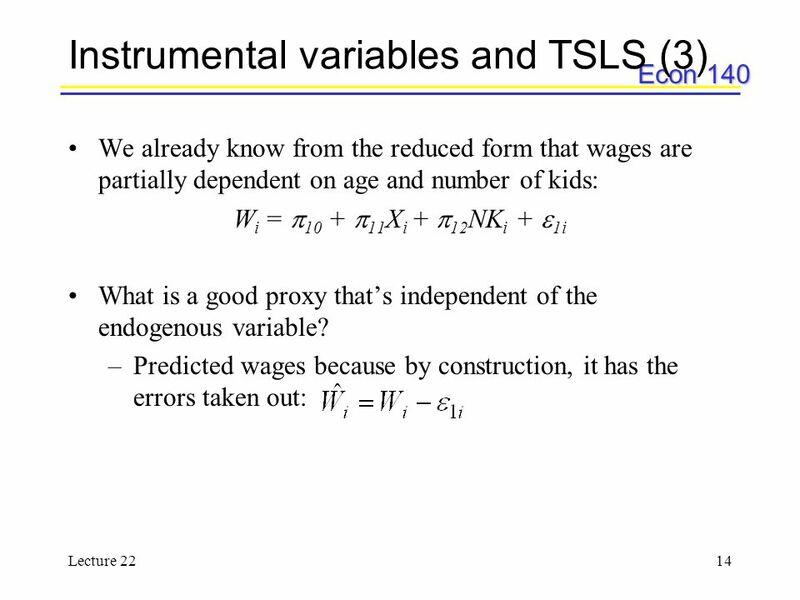 (1) Model misspecification or Omitted Variables. 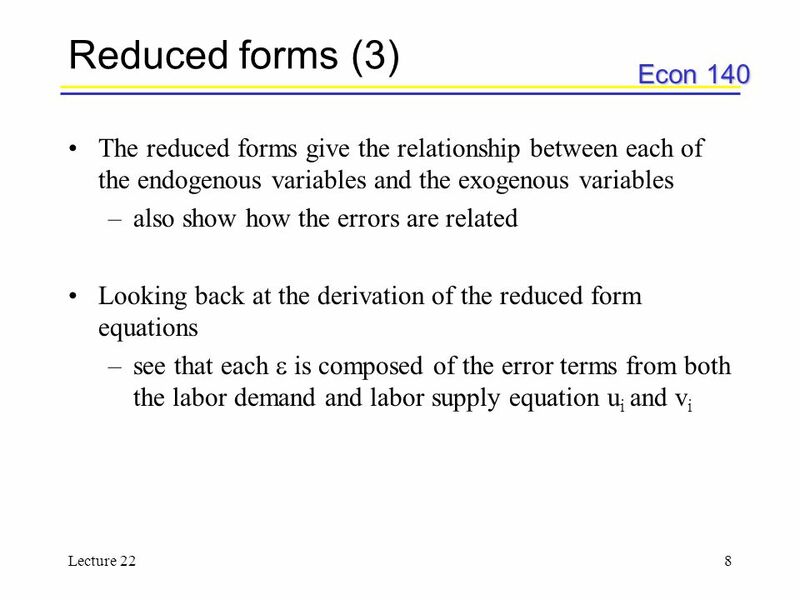 (2) Measurement Error. 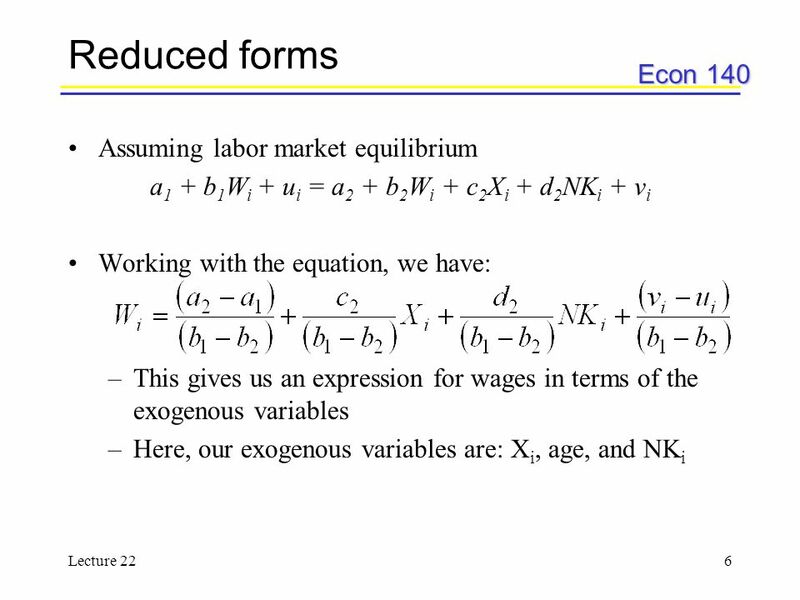 Lecture #11: Introduction to the New Empirical Industrial Organization (NEIO) - What is the old empirical IO? 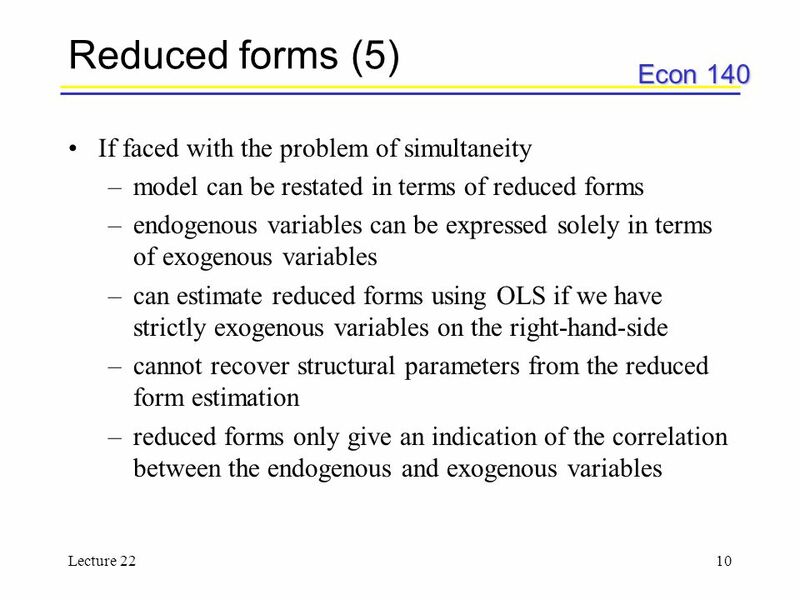 The old empirical IO refers to studies that. 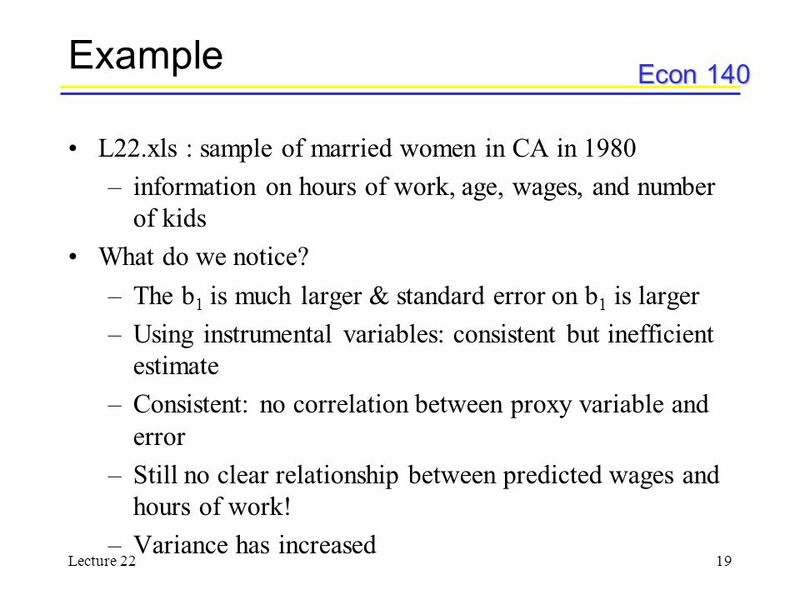 Economics 20 - Prof. Anderson1 Multiple Regression Analysis y =  0 +  1 x 1 +  2 x  k x k + u 7. 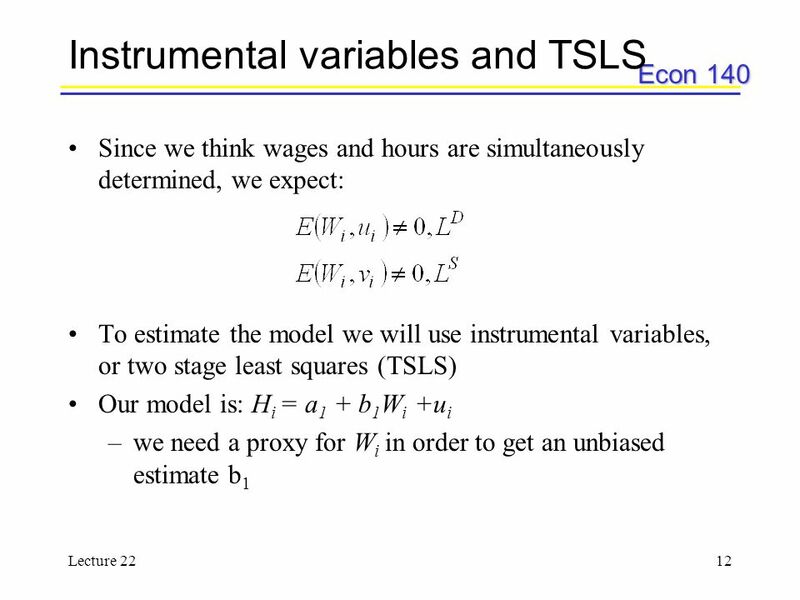 Specification and Data Problems. 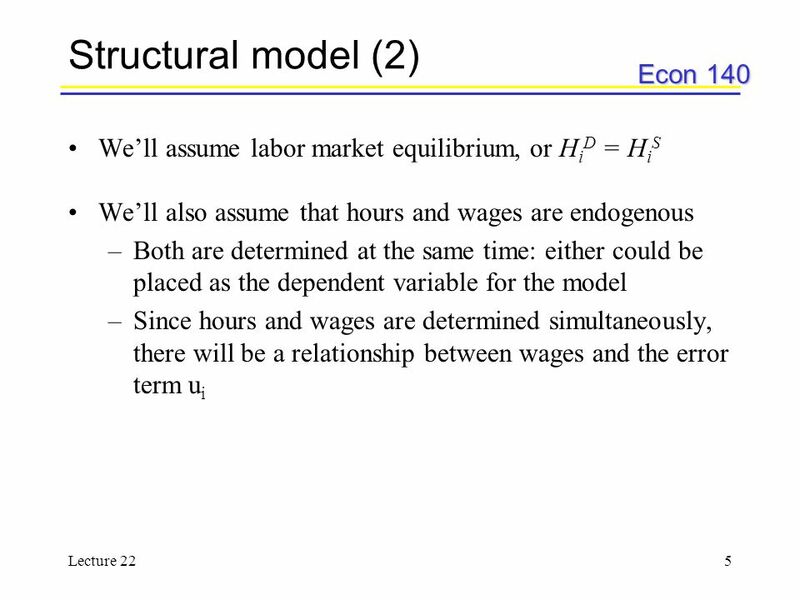 Econ 140 Lecture 61 Inference about a Mean Lecture 6. 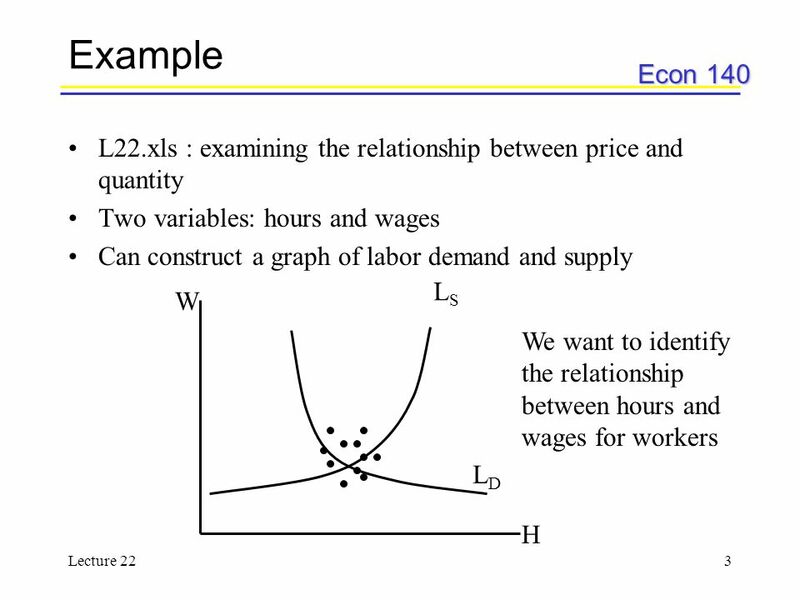 Econ 140 Lecture 151 Multiple Regression Applications Lecture 15.